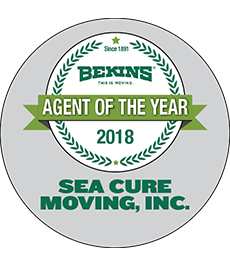 New Jersey Mover Review by Roger J.
I wanted to write and let you know what a great job the crew did during our move. Rob, Brandon, Sandy, Roland and the entire group were great to work with. The pack and load at our old house went faster than anticipated yet they never rushed to get things done. After they left, my wife and I cleaned the house for the next owner and found no dings and no scratches. We were amazed. Saturday they unloaded us at the new home, just ahead of a snow storm, and again did a great job. Constantly asking where things needed to be and making sure at the end that everything was just as we wanted it. They worked hard all three days, were always professional and they were nice guys to be around. We enjoyed them. My wife and I have moved multiple times and the one thing we have learned is that it doesn’t matter which moving company you pick, it matters who works for the company that you pick. You are lucky to have such a positive and dedicated team. I should also mention that the first positive impression we got was from Matthew. He came to our house to evaluate the move and provide an estimate. Of all the companies we met with he took the most time to listen to us and understand our concerns. He sold us on using your firm.